Powers/Abilities: Captain Hip possessed a measure of super-speed and enhanced reflexes, allowing him to effortlessly dodge multiple assailants. He could use his super-powered leg muscles to trample and stomp on his enemies at blistering speeds, rendering a normal man unconscious within seconds. He could leap several dozen feet at once, or survive falls from several stories without injury. A fierce believer in the ways of the hippie movement, Fred disliked all established forms of government bureaucracy and authority figures, particularly the Black Fox. (Marvel: The Lost Generation I#5 - BTS) - In the late 1950s, Fred MacRae was among undisclosed number of young people subjected to top secret CIA drug tests. The narcotics gave him super-speed, enhanced reflexes and stamina. 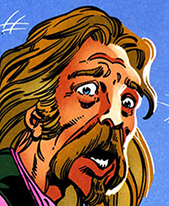 (Marvel: The Lost Generation I#5 - BTS) - By 1961, MacRae had mastered his powers and found a home for himself in San Francisco's Haight-Ashbury district. There, he fought crime as the beatnik superhero the Hipster. For several weeks, the Hipster was investigating a gang of robbers that only seemed interested in electronics (they were secretly working for the Yellow Claw). Unbeknownst to the Hipster, the First Line's Black Fox was also in San Francisco on the trail of the Claw. 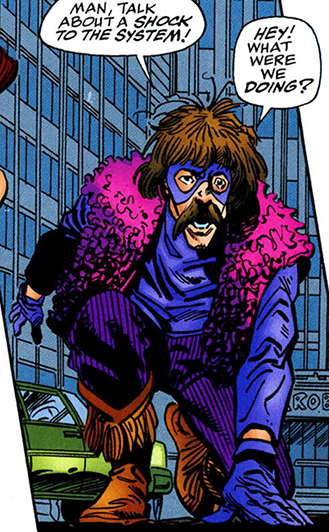 (Marvel: The Lost Generation I#3) - As the Hipster was preventing another robbery by stomping on the thieves, he was about to be shot in the back. Luckily, the Eternal Pixie saved him by using her transmutative powers to turn the man's trigger hand to stone. She then went on to turn all the thieves to stone, only missing one (who managed to get away and rushed his way back to the Claw and his lackey von Voltzmann). Impressed with the Hipster's abilities, Pixie proposed a partnership which startled the young beatnik who told the "chickerina" he was strictly a solo act. Annoyed, Pixie flew off, leaving MacRae behind in amazement. (Marvel: The Lost Generation I#3 - BTS) - Hipster waited for the petrified thieves to return to normal, taking the opportunity to question them thoroughly. However, they had very little useful information to offer as well, forcing him to continue his patrols while Black Fox observed him from a distance, grumbling to himself that the last thing his investigation needed was another loose cannon. The Fox decided to call in the First Line for backup. When the team arrived, the Fox led them to the Claw's hidden base in the Garment District. This soon led to an altercation between the First Line and the Claw's armored forces. (Marvel: The Lost Generation I#3) - At the same time, Hipster followed some of the Claw's accomplices back to the base and was right on time to join the fight, much to the surprise of the Yankee Clipper and the other heroes. Hipster handled himself well in the fight and was protected by the Clipper's force belt when the Claw decided to detonate a hidden bomb to cover his escape. In the aftermath, Liberty Girl offered him membership, but MacRae politely declined, claiming clubs, lodges and cliques were, like, too squaresville. (Marvel: The Lost Generation I#5 - BTS) - At some point during the mid 1960s, the Hipster met and fell in love with a light manipulating woman named Autumn. After they got married, Fred changed his name from the Hipster to Captain Hip on her suggestion. Together, they formed the hippie crime fighting duo known as Captain Hip and Sunshine. They immersed themselves in the counter culture youth movement of the day. (Marvel: The Lost Generation I#5 - BTS) <During the "Summer of Love"/1967> - Captain Hip and Sunshine realized something odd was happening with the young people attending a musical festival emceed by a woman calling herself Venus, the goddess of love. Unsure how to proceed, they contacted the First Line for backup. The team's leader Effigy agreed to work with Hip and Sunshine, despite the Black Fox's misgivings. (Marvel: The Lost Generation I#5) - While the First Line waited around in their temporary headquarters and Effigy quietly infiltrated the backstage area, Hip, Sunshine and Pixie attended the festival. There, Fred was shocked when his wife was swayed by the mind control powers of Venus and the old Nazi villain Rumor (whose abilities only worked on kids and managed to affect Autumn's unborn child). Frantic to get his wife back, Captain Hip confronted Sunshine and tried to talk some sense into her. However, she had no idea who he was and then proceeded to use her hypnotic light powers to sway him to Rumor's side as well. Captain Hip and Sunshine then fronted a small army of teen concert goers who rampaged through the streets, determined to topple the local government. The First Line, joined by the Asgardian thunder god Thor, tried to stop the revolt, with the Black Fox using knock out gas to control the crowds. This angered MacRae who called the Fox a fascist pig whose next step would be ovens. When Sunshine tried to use her powers to bring the Black Fox to their side, the vigilante managed to knock her out before he succumbed to her sway. Watching his wife get assaulted made Hip furious and he launched himself at the disoriented Fox who was saved from the speedster's flurry of punches by a bolt of lightning summoned by Thor. While the First Line continued their struggle against Rumor's youth revolt, Hip recovered from the electric shock of Thor's thunderbolt. When he went to check on Sunshine, he was pleased to learn she had regained control of her mind again. Hip had to wonder how Rumor had affected her with his abilities and was shocked when his wife revealed she was pregnant. In the aftermath of the fight, after Effigy and the Black Fox had taken down Rumor, the First Line member Frank wondered if Hip and Sunshine would be interested in joining the team. They both declined and stated that given Sunshine's pregnancy, they considered retiring from active super-heroics. (Marvel: The Lost Generation I#8 - (fb) - BTS) - When their daughter was born, Fred and Autumn officially named her Truth. For the first few years, the young family led a relatively quiet life in a suburb on Chicago's northside even though they would on occasion use their abilities to fight crime. Bringing up Truth was their primary concern, however, and Fred and Autumn made sure their baby was raised in the hippie tradition, with Truth calling them by their first names by age two. (Marvel: The Lost Generation I#8 - BTS) - Around 1972, Captain Hip was injured during a fight with the Purple Gang, a band of criminals he insisted on tackling alone. The encounter left him wheelchair bound with a broken right leg. To cheer her husband up, Autumn arranged tickets for a Grateful Dead concert for the three of them. 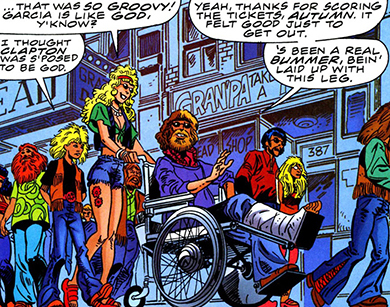 (Marvel: The Lost Generation I#8) - Returning home from the concert, with Autumn pushing Fred's wheelchair, the MacRae family was targeted by a group of muggers who figured them for nouveau riche deadheads ready for plucking. Before either Fred or Autumn could defend themselves, they were rescued by the Black Fox, who cheerfully mopped the floor with the bandits. Fred did not appreciate the Fox's assistance however, and he berated the Black Fox after he'd defeated all the assailants. Just as the Fox was preparing to leave the scene, MacRae called the Fox a fascist pig who "probably voted for Nixon" while his wife looked on. (Marvel: The Lost Generation I#8 - BTS) - Unbeknownst to either Fred or Autumn, watching the Black Fox in action started their daughter T.Ruth's lifelong obsession with the Fox. Meanwhile, as the Black Fox returned to his home base, he couldn't help but feel there was something familiar about "that old hippie." (Marvel: The Lost Generation I#10 (fb) - BTS) - As the years went on, T. Ruth's fascination with the Black Fox grew into a full blown obsession. Aware her parents didn't care for the vigilante and his outlaw, violent ways she hid her collection of Fox photos and newspaper clippings from them. When she was in high school, she realized she had inherited some of her parents' superpowers, but decided not to tell them about it. (Marvel: The Lost Generation I#10 - BTS) - Fred and Autumn discovered their daughter's stash of Black Fox memorabilia and decided to confront her about it. (Marvel: The Lost Generation I#10) - Returning home from school one day after forensics club ran late, T. Ruth was shocked to find Fred and Autumn in her room. Growing outraged when Fred wanted to know why she had all these photos of that masked crypto-fascist, Autumn tried to use her light powers to calm everyone down. Angrily defending the Black Fox as a proper hero, T.Ruth then pointed out that her parents were the real fascists for having so blatantly violated her personal space. When the argument led nowhere, T.Ruth jumped out of her bedroom window, fell three stories and ran off, much to the astonishment of Fred and Autumn. Fred immediately sped after her, but T.Ruth's managed to evade him, which led a frantic Fred to conclude his daughter had inherited more than a small measure of his abilities. Comments: Created by Roger Stern (writer), John Byrne (pencils), Al Milgrom (inks). It only makes sense there would be some beatnik-turned-hippie superheroes during the 1960s. In the actual sixties, Marvel never got around to creating even a single one... Which is understandable if you consider Stan and Jack were already married men with kids by the time they collaborated on 1961's Fantastic Four I#1. Doctor Strange, living in hip and happening Greenwich Village, became the closest Marvel got to an actual hero for the psychedelic era. According to Stan Lee's secretary "Fabulous" Flo Steinberg, fans of the book regularly wrote in, wondering what Steve Ditko was smoking to dream up the groovy, far out dimensions Strange traveled to. The notion that the CIA tested experimental drugs on America's youth to see if they developed enhanced abilities is an interesting one that should have resulted in more super powered operatives in either the days of the Lost Generation or the modern era. Captain Hip/Hipster was a fun character who showed a lot of promise. Based on his powers, he was the Quicksilver of his day, but unlike Pietro Maximoff, Fred was mostly laidback and easy to get along with in spite of the fact his powers enhanced his overall speed and reflexes. He mostly preferred to enjoy the bliss of family life over the rush of super-heroics. Captain Hip was not among the ones the First Line enlisted to combat the imminent Skrull invasion, a mission that ended in the extermination of Earth's pre-modern era super-team. It's more than a little likely Fred and Autumn are still out in Chicago, mourning the loss of their only child. It's not clear whether Frank from the First Line is definitely the Frankenstein monster or not. The First Line and Frankenstein Monster profiles in the OHotMU are contradictory in this regard, with the former saying they are the same and the latter saying it is "unknown." As the head writer of the Official Handbook of the Marvel Universe at that time, I can tell you, the official policy is: Frank of the First Line is apparently either a Frankenstein monster � meaning a creature created in the manner of Victor Frankenstein�s first creation � or just a being with a similar appearance and abilities who adopted the name Frank due to the notable similarities. However, it as yet remains unrevealed whether Frank is actually the original creation of Victor Frankenstein, aka �the Frankenstein monster.� Previous entries referencing Frank as �Frankenstein monster� were unclear in specifying/clarifying this point. Further, the Rumor profile in Thor: Asgard's Avenger, erroneously notes the Venus who was involved with Rumor to have been the siren. The Venus/Aphrodite/goddess profile in her Official Handbook of the Marvel Universe entry confirms this to have been the goddess. The Rumor entry is in error.